Deniz Cem Önduygu likes to understand things and to make them more understandable. He loves philosophy of biology, memetics, monsters, molecular biology, neuropsychology, philosophy of mind, trash television, typography, and information design. He has a Master of Arts degree in Visual Arts & Visual Communication Design from Sabancı University where he also took graduate level courses in biology. His research and his passion to create a memetic model for the designer’s mind resulted in an evolutionary graphic design program. 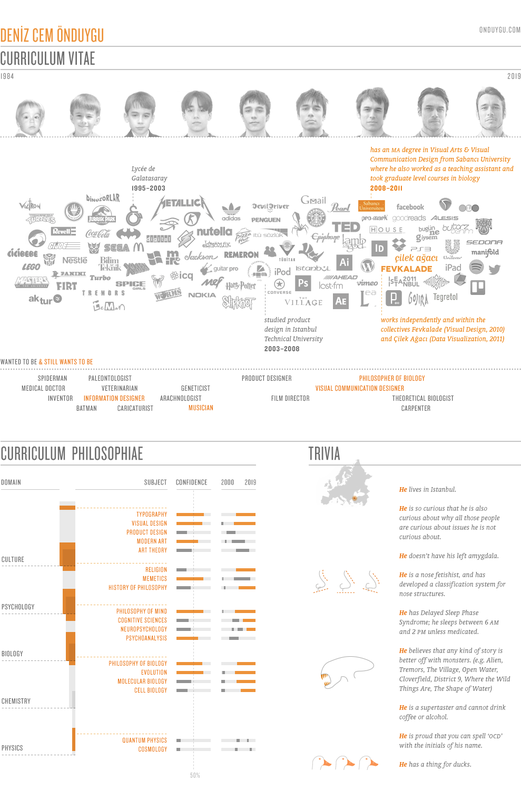 His self-education on the history of philosophy turned into an extensive interactive visual summary. In his free time he works as a visual communication designer independently and within Fevkalade of which he is a co-founder. He is also one of the three founding members of Çilek Ağacı, an award-winning collective working on data engineering and visualization. And no, he doesn’t do “infographics”. He blogs on philosophy and design among other things. He speaks at various events about his personal work and information design in general. He also writes for Manifold in Turkish. Cem lives in Istanbul, feeds on large amounts of chocolate, misses his left amygdala, and enjoys writing about himself in the third person. You can follow me on Twitter.